ClearLLab Control Cells -a liquid preparation of stabilized human erythrocytes and leukocytes (lymphocytes monocytes and granulocytes) - the first application-specific IVD control cells for L&L immunophenotyping as part of a validated system. ClearLLab Control Cells include assay values for the 27 markers currently available on the four ClearLLab10C panels, available for both normal and abnormal controls. The ClearLLab 10C System incorporates the company’s new Kaluza C software to streamline and standardize clinical QC reporting to international guidelines. It delivers high-quality results from dry unitized combinations of CD (cluster of differentiation) markers, using Beckman Coulter’s DURA Innovations dry technology. These pre-formulated antibody combinations help the lab avoid the potential errors of manual antibody cocktail preparation. The four ClearLLab 10C panels are designed specifically to run on Beckman Coulter’s Navios and Navios EX flow cytometers, with new, advanced Navios compensation setup software. When using the ClearLLab 10C system, compensation is only required on initial set-up of the application, when daily QC fails, after instrument service as needed, or when switching to a new lot of Flow-Set Pro. ClearLLab 10C is also supported by a unique, training resource, the ClearLLab 10C case book. This provides 24 diagnostic vignettes giving characteristic findings after flow cytometric analysis, with expert assessment by hematopathologists. Labs can also compare the interpretation of their own findings with the analysis in the casebook. The ClearLLab 10C System is an integrated solution, offering labs standardized workflow that delivers greater confidence in the consistency and reliability of their clinical findings. 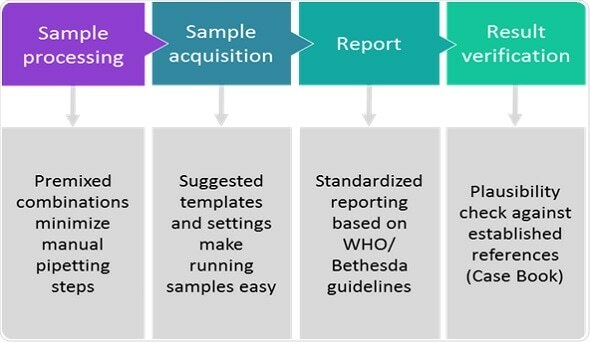 With the ClearLLab 10C System, workflow is reduced to four straightforward, standardized steps– sample processing, sample acquisition, reporting and validation (see Figure). 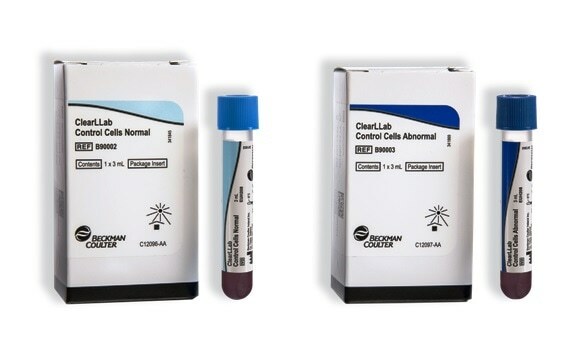 In 2017, the five- color ClearLLab Reagents panels were the first pre-formulated, IVD antibody cocktails for leukemia and lymphoma immunophenotyping to be approved by the FDA de novo process for in vitro diagnostic use in the US. The FDA confirmed that they provided ‘consistent results to aid in the diagnoses of these serious cancers’ after evaluating data from a multi-site clinical study (which compared panel results to alternative detection methods). ClearLLab reagents follow the 2006 Bethesda International Consensus Recommendations on the Flow Cytometric Immunophenotypic Analysis of Hematolymphoid Neoplasia. They are compatible with the World Health Organization (WHO) 2016-revised classification of myeloid neoplasms and acute leukemia. WHO, in collaboration with the European Association for Hematopathology and the Society for Hematopathology, recently made important changes to the classification of these diseases. These included new criteria for the recognition of some previously described neoplasms as well as clarification and refinement of the defining criteria for others.